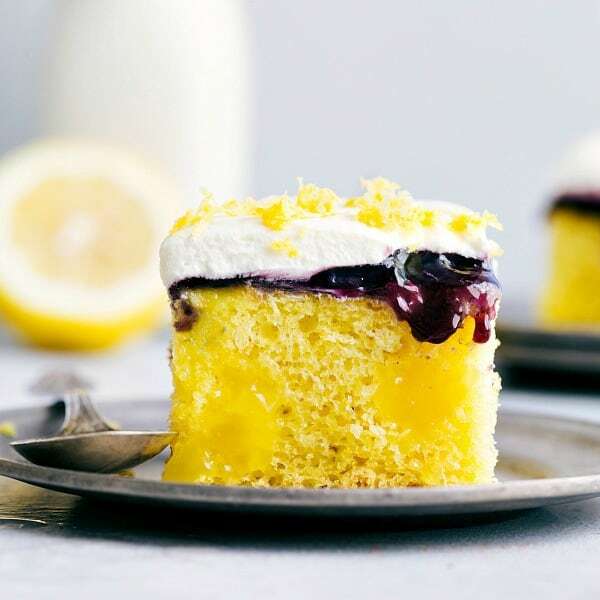 Lemon Blueberry Poke Cake is a tender and moist lemon cake filled with lemon curd topped with a blueberry filling and whipped topping. This is a perfect summer cake and will be a hit wherever it goes! I am having the baby tomorrow! Can you believe it? I really can’t either. It still hasn’t hit me yet that I am going to have another little babe to add to our family. But things are going to get pretty real here soon and we can’t even wait to meet her! I have so many delicious posts lined up for you and will be taking some much needed time off to enjoy my last baby. I couldn’t wait to share this delicious cake with you today. 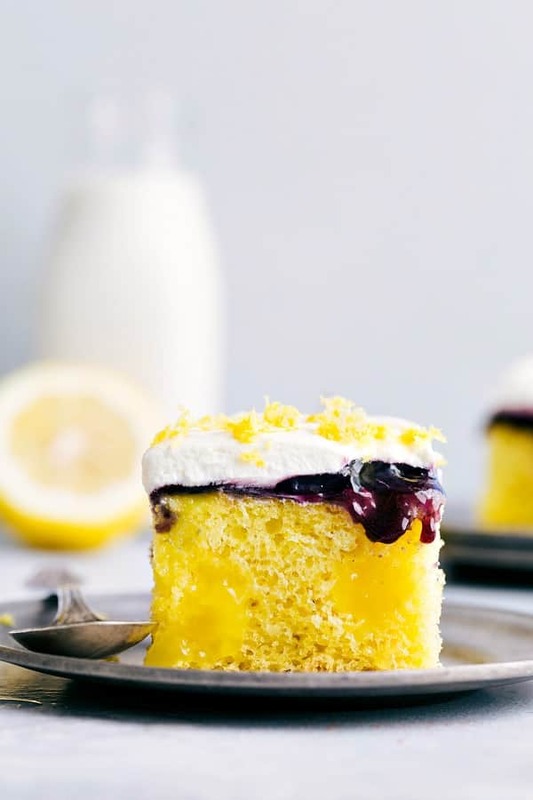 I love love love the lemon blueberry combination and this cake is fantastic. It is made with Lucky Leaf’s premium blueberry fruit topping. Each can is filled with delicious blueberries. Poke Cakes are my favorite and I feel like they make a yummy summer dessert. You start by making the cake. 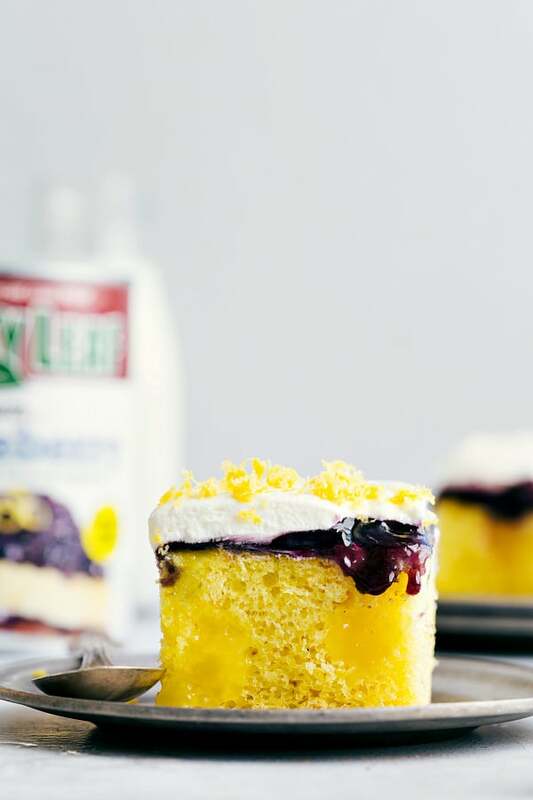 You poke some holes and then fill it with lemon curd and top it with blueberry topping. Doesn’t that sound delicious? My mouth is watering! Once you have the blueberry topping you spread it with cool whip. This cake is actually quite simple to put together and a huge crowd pleaser. 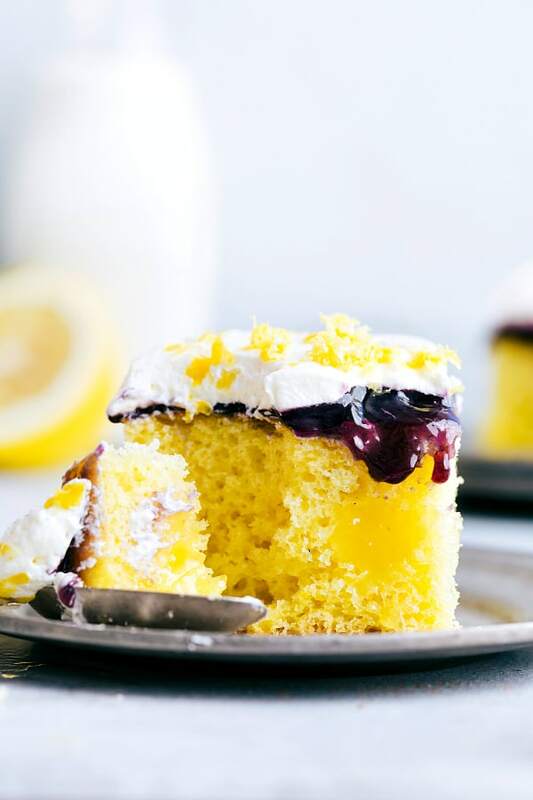 Every layer is delicious and the hidden lemon curd inside the cake is perfect with every bite. The blueberry topping adds such a great texture and flavor and takes this cake to the next level. Serve it at your next gathering! You will love it just as much as our family did! Bake the cake according to package directions in a 9 x 13 cake pan. Remove and allow to cool for 10 minutes. Using the end of a wooden spoon, poke holes throughout the cake. Prepare the lemon pudding mix by whisking the mix and the whole milk together. Immediately pour it over the cake, aiming to fill the holes. Immediately (don't let the pudding set up! 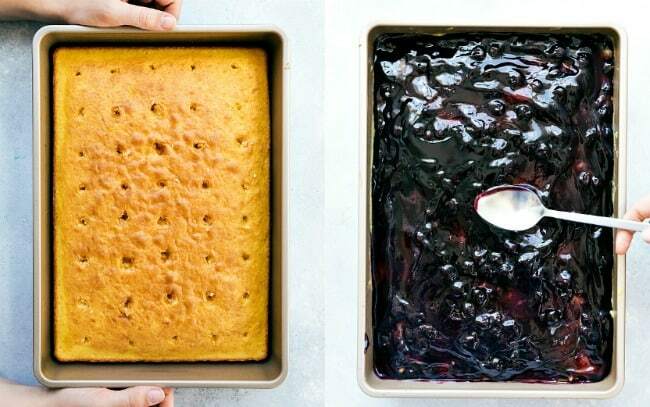 ), add the blueberry pie filling over the cake and, using a spatula, gently press the pie filling also into the holes and spread the remainder of the filling smoothly over the top. Cover the cake and place in the fridge to set up, at least one hour and preferably two. With a spatula, fold together the completely thawed whipped cream and lemon curd until smooth. Remove from the fridge and spread the whipped cream over it. If desired, garnish with lemon zest and enjoy! hey girl- this cake looks amazing! So exciting that your having the baby today! so cool! I’ll be praying for you. Thanks SO much!! I am so excited to have my baby girl in just a few short hours!! I am so ready:)!! What is lemon curd? And congrats on your new baby. Thank you so much!! We are smitten by her! More pictures to come soon!! Much happiness with your new little one. Anytime you get to it this year is fine, Is the lemon pudding cooked or instant? It looks wonderful, but I can’t figure it out in my mind, and I’d like to get it right.